Yohei Watanabe obtained his Ph.D. from the Graduate School of Medicine, Osaka University (2007). He served as Postdoctoral Fellow in the Department of Virology, Research Institute for Microbial Diseases, Osaka University (2006-2011), Assistant Professor at the Research Center for Infectious Disease Control, Research Institute for Microbial Diseases, Osaka University (2011-2014) and currently as Assistant Professor in the Department of Infectious Diseases, Graduate School of Medical Science, Kyoto Prefectural University of Medicine, Japan. His research focuses on the host-adaptive mechanism of zoonotic viruses. Since its emergence in 1996, highly pathogenic H5N1 subtype avian influenza virus has posed a massive threat to public health. Recent human infections by avian influenza viruses other than the H5N1 subtype also necessitate continuous surveillance of avian influenza in the field. Thus far, most human infection by avian influenza viruses has resulted from close contact with infected birds, and viruses have not yet fully acquired fitness to infect humans. However, repeated bird-to-human transmission may generate avian influenza virus variants with greater fitness by accumulation of point mutations and/or reassortment. The details of adaptive changes in avian influenza virus to new hosts remain largely unknown. This manuscript provides an overview of current knowledge on the host adaptive mechanism of avian influenza viruses, focusing on glycan-mediated human adaptation by highly pathogenic H5N1 avian influenza viruses and describe a novel rapid detection system of avian influenza virus that may be useful for effective surveillance. Influenza A virus is divided into subtypes according to the antigenicity of two viral surface glycoproteins, hemagglutinin (HA) and neuraminidase (NA); to date, 18 HA and 11 NA subtypes have been identified. The 18 HA subtypes are phylogenetically categorized into group 1 (H1, H2, H6, H8, H9, H11, H12, H13, H16, H17 and H18) and group 2 (H3, H4, H7, H10, H14 and H15) HAs, with HAs in the same group antigenically related1-3. Almost all influenza viruses have their origin in avian influenza (AI) virus in waterfowl. AI viruses are transmitted to different species by acquiring fitness to new hosts4. The highly pathogenic H5N1 subtype avian influenza virus (H5N1 virus), circulating in Eurasia and Africa, emerged in China around 19962. H5N1 virus is now endemic in bird species in some areas, including China, Vietnam, Indonesia and Egypt5. H5N1 virus can be transmitted directly from birds to humans and cause severe respiratory disease. As of November 2015, WHO has reported 844 cases of human H5N1 infections with 53% mortality. While human H5N1 infection has been previously reported mainly in Asia, Egypt has recently experienced a relatively large number of human infections since 2009. Continuous circulation of the H5N1 virus has allowed the virus to diversify genetically to form phylogenetically and phenotypically distinct clades (designated clades 0-9) in different areas2. In addition, the H7N9 AI virus that emerged in China in 2013 has caused 440 human infections with 27% mortality as of May 20146. Furthermore, first human infection cases of other subtype AI viruses have been reported, including H5N6 in 2014 (China), H6N1 in 2013 (Taiwan), H9N2 in 2013 (Hong Kong) and H10N8 in 1992 (China)1, 2. Human infections with H7N2 in 2003, H7N7 in 2003 and H7N3 in 2004 have also been reported. Influenza virus infection requires binding of viral HA to host glycan or gangliosides that terminate in sialic acids (Sias)7. There are over 50 natural modifications of the Sia core structure. Notably, N-acetylneuraminic acid (Neu5Ac) and N-glycolylneuraminic acid (Neu5Gc) are important for infection by influenza A viruses (Fig 1A-I)7) . The most common sialyl terminal substituents are Neu5Ac-α2,3-galactose (Neu5Acα2,3Gal) and Neu5Ac-α2,6-galactose (Neu5Acα2,6Gal). Influenza virus recognizes the Sia linkage 2-3 or 2-6 (Fig 1A-II)7. Human influenza viruses preferentially bind to sugar chains ending in Neu5Acα2,6Gal (α2,6 Sia), whereas most avian viruses preferentially bind to sugar chains ending in Neu5Acα2,3Gal (α2,3 Sia)1, 2, 7. The difference in binding specificity between human and avian viruses coincides with their tissue tropisms. Human influenza viruses that infect human upper airway epithelia express mostly α2,6 Sia, whereas avian viruses that infect waterfowl intestinal epithelia express mostly α2,3 Sia (Fig 1A-V). This provides an interspecies barrier preventing AI viruses from easily infecting humans. A change in receptor specificity from α2,3 Sia to α2,6 Sia is thus essential for AI virus to become a pandemic virus8. Past pandemic viruses, including Spanish flu (H1N1) in 1918, Asian flu (H2N2) in 1957, Hong Kong flu in 1968 (H3N2) and H1N1pdm in 2009 showed α2,6 Sia specificity despite their origin in host species other than humans. In past pandemics, mutant viruses with dual tropism for both α2,3 Sia and α2,6 Sia have emerged in the immediate early phase of an outbreak9. Most HA mutations detected in H5N1 viruses in the field did not indicate a complete switch in receptor specificity in the original virus genetic background10-12. However, recent studies conducted to experimentally generate mutant viruses reported a small number of HA mutations enabling the viruses to fully switch binding specificity from bird type to human type13-16. Swine and terrestrial poultry such as chicken and quail contain both α2,3 Sia and α2,6 Sia on their respiratory epithelia17, 18. Thus, repeated virus transmission among these animals may generate AI virus variants with enhanced α2,6 Sia binding affinity. Until now, several new sublineages of H5N1 virus have emerged in Egypt during viral diversification in local bird populations, with dual binding affinity to both α2,3 Sia and α2,6 Sia11. Furthermore, one dual tropic H5N1 virus strain was isolated from an Indonesian pig10. Moreover, H7N2 subtype virus strains isolated from North American poultry had dual α2,3 Sia and α2,6 Sia binding affinity19. Human lower airway epithelia express both α2,3 Sia and α2,6 Sia, enabling H5N1 virus with α2,3 Sia preference to directly infect the lower respiratory tract, resulting in severe respiratory disorder20. It was also noted that the expression profile of α2,3 Sia and α2,6 Sia on airway epithelia changes depending on the disease, inflammation and host age2. These findings suggest that the risk of direct bird-to-human transmission of AI viruses may be greater than previously thought. A genetic analysis reported a variety of HA mutations that were positively selected in Thai patients infected with H5N1 virus21. One H5N1 virus strain isolated from an infected Vietnamese individual had binding affinity to both α2,3 Sia and α2,6 Sia12. Also, one H7N3 AI virus strain with partial switching of the receptor preference was isolated from an infected patient in North America in 200319). These observations suggest that the AI virus acquires α2,6 Sia preference after infecting patients. (A) The structure information in the entire glycan chain (I)−(V) affects viral Sia specificity, although human and bird virus recognize primary NeuAca2,6Gal or NeuAca2,3Gal, respectively (red). (B) a2,3 and short a2,6 sialylglycans interact with HA in a narrow “cone-like” topology. In contrast, long a2,6 sialylglycans, which are widely present in human airway epithelia, contract HA in a wide “Umbrella-like” topology. AI viruses are assumed to need to adapt to the characteristic human long a2,6 sialylglycan topology to efficiently infect humans. The figure was adapted, with permission from Watanabe et al., Trends Microbiol 2012. So far, the details of human adaptive change in AI viruses, including H5N1 virus from patients, remain largely unknown. To address this issue, using a database search approach, the author and his group identified multiple HA mutations that presumably had been selected by viral replication in H5N1-infected patients and investigated the effect of the mutations on viral phenotype22. The results showed that most HA mutations enhanced H5N1 virus binding specificity to α2,6 Sia. A few mutations also resulted in an appreciable decrease in α2,3 Sia binding and an increase in α2,6 Sia binding, causing partial switch of the viral Sia specificity, although this change may not have been sufficient for human adaptation because the α2,6 Sia specificity was less than that of seasonal human viruses (Fig 2A−C vs D−F). Solid-phase receptor binding assay using sialylgycan with one, two, or three lactosamine (LN: Galβ1,4GlcNAc) repeats revealed that the effects of the HA mutations to increase α2,6 Sia specificity were greater for longer sialylglycans (α2,6 SLN1<α2,6 SLN2<α2,6 SLN3) (Fig 2D−F). In contrast, the HA mutations produced relatively constant binding specificity for long α2,3 sialylglycans (α2,3 SLN1=α2,3 SLN2=α2,3 SLN3). Recent mass spectrometry analyses showed a remarkable diversity of sialylglycan on human airway epithelia, with long (>2 LN repeat) α2,6 Sia branches predominating23, 24. Glycan−HA co-crystal structures suggested that recognition of the wide “umbrella-like” topology characteristic of long α2,6 sialylglycan, but not the α2,6 Sia linkage itself, may be crucial for adaptation and pandemic spread of AI virus in humans23 (Fig 1B). In contrast, α2,3 sialylglycan and short α2,6 sialylglycan interact with HA in a narrow “cone-like” topology. These findings suggest that most HA mutations selected by viral growth in patients increased H5N1 virus binding specificity for long α2,6 sialylglycans, which are widely present in human airway epithelia. 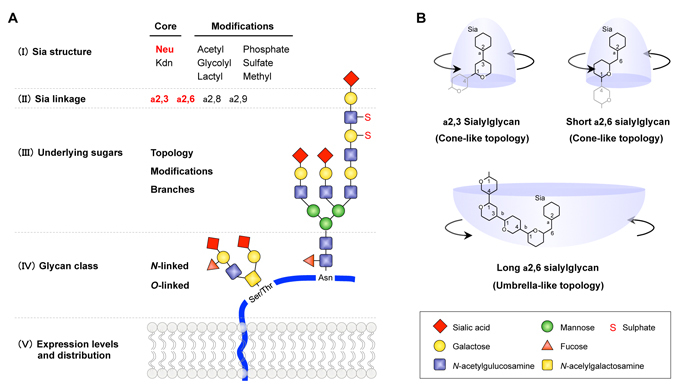 Moreover, screening of HAs on a glycan microarray showed that the Sia specificity of different HAs differ markedly not only in Sia linkage but also in other internal sugar modifications, such as fucosylation25, 26 (Fig 1A-III). Thus influenza viruses appear to recognize the great diversity and complex topology of sialyglycans in living organisms. The effect(s) of HA mutations on viral replication in primary human airway epithelial cells was investigated. Interestingly, the HA mutations that increased α2,6 Sia specificity were not always found to increase H5N1 replication in human airway cells, implying that the α2,6 Sia binding specificity is not the sole determinant of H5N1 growth kinetics in human airway epithelia. HA has two main functions: viral attachment to host cells and membrane fusion after viral endocytosis4. Membrane fusion is triggered by low endosomal pH, which induces irreversible conformational changes in HA, leading to fusion of the viral and endosomal membranes. We assessed the effect of the HA mutations on the pHs at which HAs were activated. The results showed that all the HA mutations that increased H5N1 growth kinetics in human airway cells also raised both α2,6 Sia specificity and the pH threshold for membrane fusion. Different influenza HA subtypes have a range of pH phenotypes with different fusion characteristics27. Several reports also suggested that differences in HA membrane fusion activity among AI virus subtypes may influence their infectivity28. Moreover, cell type-dependent endosomal pH is important for influenza virus infection29. A recent report also suggested that late endosomal pH levels in human respiratory cells may not be so low for efficient fusion activation of H5 subtype HAs30. These findings suggest that H5N1 virus may acquire HA mutations that elevate the optimal HA pH fusion threshold to more effectively infect human airway epithelia. Among the HA mutations selected from patients, most mutations increased α2,6 Sia specificity, while a small number of mutations elevated both α2,6 Sia specificity and pH threshold for membrane fusion. This suggested that there was selective pressure on H5N1 viruses in human airway epithelia, primarily to increase viral α2,6 Sia specificity. Nonetheless, our findings suggest that H5N1 virus may acquire HA mutations that increase α2,6 Sia specificity and the HA pH threshold for optimal membrane fusion, both of which are advantageous for viral replication in human airway epithelia. Concurrence between increased α2,6 Sia specificity and increased pH threshold for membrane fusion was also observed during host adaptation in ferret transmission studies15, 16. Taken together, the above findings suggest that H5N1 viruses can rapidly adapt to the human airway microenvironment by acquiring HA mutations that alter the Sia specificity and pH threshold for membrane fusion in infected patients. These data begin to clarify the picture of the mechanism of H5N1 adaptation for human infection. Apparent association constants (Ka) were determined by nonlinear regression fitting of solid-phase receptor binding assay data. The receptor binding specificity for a2,6 SLN1 (A and D), a2,6 SLN2 (B and E) and a2,6 SLN3 (C and F) are expressed as Ka(a2,6 SLN1)/Ka(a2,3 SLN1), Ka(a2,6 SLN2)/Ka(a2,3 SLN1) and Ka(a2,6 SLN3)/Ka(a2,3 SLN1), respectively. The data are expressed relative to the results for wild-type (Wt) virus. Each data point is the mean ± standard deviation. Specificities of H5N1 HA variants (D, E and F) are compared with those of seasonal human viruses (A, B and C). *P < 0.01 (Student’s t test). The figure was adapted with permission from Watanabe et al., MBio 2015. Accelerated progress in genetic technologies has facilitated prediction of viral characteristics solely from genetic information. However, given the mutable and diversifying nature of AI viruses, it is important to directly phenotype the viruses for infectivity, antigenicity and pathogenicity. In AI surveillance, it is essential to determine whether a particular AI virus strain is adapting to α2,6 Sia. Especially in countries where the H5N1 virus is active, rapid diagnostic assays that distinguish Sia preference of AI viruses are needed to enable rapid initiation of infection-control measures. Several new technologies have recently emerged for analyzing the interaction of influenza virus with Sia. Dose-dependent direct binding assay10-12, 15, 21, 22 and glycan microarray31 have enabled quantitative and high-throughput analyses, respectively. Recent studies also reported a surface plasmon resonance technique and waveguide mode sensor method, both of which provide very sensitive detection of Sia specificity of influenza viruses32. However, these assay systems require a high level of technical expertise, expensive reagents and specialized equipment. Since H5N1 virus circulates mainly in rural areas, portable and simple kits are needed to facilitate the characterization and assessment of AI outbreaks2. Recently, the author and his research group developed a novel easy-to-use immunochromatographic strip test to detect the emergence of AI viruses with increased α2,6 Sia specificity33. The test system includes an expansion solution, an antibody solution and two test strips (Fig. 3A). The expansion solution is a mixture of surfactant agents in concentrations sufficient to inactivate influenza virus infectivity. The antibody solution contains a biotinylated anti-HA antibody, named C179. C179 is a monoclonal antibody against an antigenically conserved HA region and has been reported to bind to a broad range of group 1 influenza HAs (H1, H2, H5, H6 and H9). Each test strip consists of four components assembled on a plastic base material: a sample pad, a conjugate pad, a nitrocellulose membrane and an absorption pad. The conjugate pad contains either a blue latex-conjugated α2,3 sialylglycopolymer or a red latex-conjugated α2,6 sialylglycopolymer (denoted α2,3 Sia strip and α2,6 Sia strip, respectively). Avidin and lectin are dispensed at different positions of the membrane to denote the test and control lines, respectively. The detection procedure is as follows (Fig. 3A). Thirty ml of virus sample is mixed with 90 ml of expansion solution and 30 ml of antibody solution then incubated for 15 min to form a virus–biotinylated antibody complex. Each mixture is then dropped on a test strip sample pad, allowing the mixture to migrate along the strip by capillary action. During migration through the conjugate pad, the virus−biotinylated antibody complex forms a complex with α2,3 Sia or α2,6 Sia, depending on the viral Sia specificity. As the virus−biotinylated antibody−sialylglycopolymer complex migrates along the test strip, it is captured at the test line by avidin−biotin interaction. Accumulation of the trimeric complex generates blue and red test lines on the α2,3 Sia and α2,6 Sia strips, respectively. Excess complexes and free sialylglycopolymers are captured at the control line by lectin−glycan interactions, resulting in visible blue and red control lines on α2,3 Sia and α2,6 Sia strips, respectively. The results of the assay are observed by the naked eye 15 min after dropping the mixture on the test strips. The presence of double blue lines on the α2,3 Sia strip and double red lines on the α2,6 Sia strip indicate virus binding affinity to α2,3 Sia and α2,6 Sia, respectively. A single blue control line on the α2,3 Sia strip and a single red control line on the α2,6 Sia strip indicate no binding affinity to α2,3 Sia and α2,6 Sia respectively, or that the result is below the detection limit of this assay. If a control line does not appear within 15 min, the test is considered invalid. In past influenza pandemics, virus mutants with dual tropism to both α2,3 Sia and α2,6 Sia have emerged in the immediate early phase of an outbreak. These prototype viruses substantially switched their Sia specificity from bird type to human type to become established pandemic viruses. Thus, based on the patterns of the test lines on the α2,3 Sia and α2,6 Sia strips, viral Sia specificity is identified as follows: a single blue test line indicates typical α2,3 Sia specificity, the appearance of both blue and red test lines indicates increased α2,6 Sia binding affinity, denoting the presence of interphyletic virus mutants, and a single red test line indicates α2,6 Sia specificity, denoting a novel virus with high pandemic potential or a pandemic virus (Fig. 3B). This test strip system is simple, easy to use, and does not require any special equipment or skills. We verified the potential applicability of the test strips using multiple AI virus strains isolated in several geographic areas. The strip test was able to detect Sia specificity of a wide range of influenza A viruses, as well as small increases in the binding affinity of H5N1 virus variants to α2,6 Sia at viral titers >128 hemagglutination units (Fig. 4). However, the sensitivity of the test strips is still not adequate for rapid diagnosis of clinical samples (e.g., nasopharyngeal swabs). Nonetheless, once the sensitivity is improved the strip test system described here can be applied for rapid diagnosis in the field to monitor possible evolutionary changes in Sia specificity of group 1 influenza A viruses. (A) Schematic of the test strip. A virus sample and biotinylated anti-HA antibody were mixed and incubated for 15 min. The mixture was then applied on the sample pad. During migration though the conjugate pad, virus−biotinylated antibody complexes formed a colored sialylglycopolymer−virus−biotinylated antibody complex, which was captured by avidin at the test line. Accumulation of the trimetric complex produced a visible test line with the color of the bound sialylglycopolymer (a2,3 Sia, blue; a2,6 Sia, red). Excess complexes and free sialylglycopolymers were captured by lectin at the control line. The strip test was complete 15 min after the mixture was applied on the sample pad. A photograph of the strips is also shown. (B) Schematic illustration of the viral Sia specificity patterns on the test strip. Based on the patterns of visible bands on the a2,3 Sia and a2,6 Sia strips, viral Sia specificity was identified as indicated. The figure was adapted with permission from Watanabe et al., Biosens Bioelectron 2015. Fig. 4　Sensitivity and specificity of the test strips. Test strip patterns as a function of viral hemagglutination unit (HAU) titers. (A) Human H1N1 strain: A/Suita/117/2011. (B) Bird H5N1 strain: A/duck/Eygpt/D1Br/2007. (C) H5N1 mutant strains with increased a2,6 Sia binding affinity and residual binding to a2,3 Sia. + indicates a positive result. The figure was adapted with permission from Watanabe et al., Biosens Bioelectron 2015. Recent studies suggest the existence of a greater than previously assumed complexity of sialylglycan topology in living organisms including influenza virus. It has also been reported that functional balance between HA and NA as a sialidase is necessary for efficient transmission of influenza virus34, 35. Further studies are required to elucidate the molecular basis of glycan-mediated host adaptation of influenza viruses. 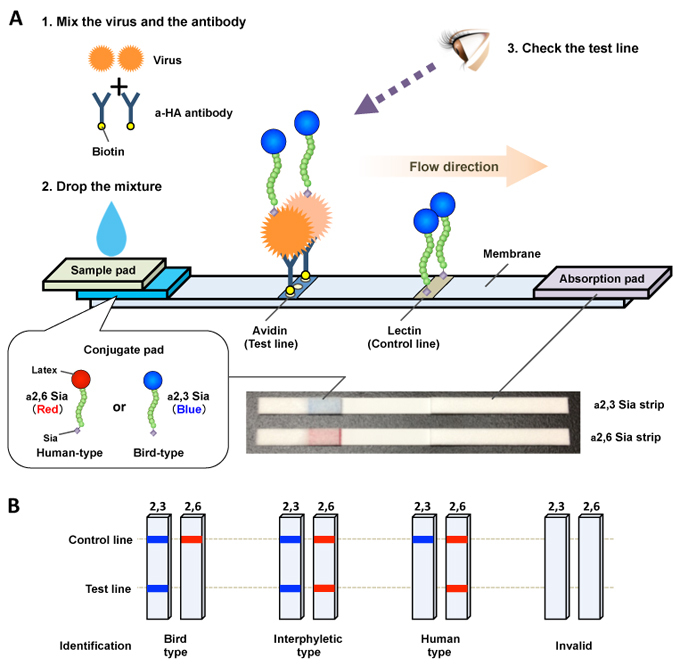 The development of an easy-to-use diagnostic system to detect influenza virus with higher sensitivity and portability than currently exists will enable improved monitoring of AI evolution in the field. We thank Professor Yasuo Suzuki (Chubu University, Japan) for valuable advice and assistance in our work. This study was supported by JSPS KAKENHI grant numbers 15H05295, 15K08497 and 23406017. 1. Neumann, G., and Y. Kawaoka. Transmission of influenza A viruses. Virology 479-480:234-246, 2015. 2. Watanabe, Y., M. S. Ibrahim, Y. Suzuki, and K. Ikuta.The changing nature of avian influenza A virus (H5N1). Trends Microbiol 20:11-20, 2012. 3. Webster, R. G., and E. A. Govorkova. Continuing challenges in influenza. Ann N Y Acad Sci 1323:115-139, 2014. 4. Webster, R. G., W. J. Bean, O. T. Gorman, T. M. Chambers, and Y. Kawaoka. Evolution and ecology of influenza A viruses. Microbiol Rev 56:152-179, 1992. 5. Watanabe, Y., M. S. Ibrahim, and K. Ikuta. Evolution and control of H5N1. A better understanding of the evolution and diversity of H5N1 flu virus and its host species in endemic areas could inform more efficient vaccination and control strategies. EMBO Rep 14:117-122, 2013. 6. Watanabe, T., S. Watanabe, E. A. Maher, G. Neumann, and Y. Kawaoka. Pandemic potential of avian influenza A (H7N9) viruses. Trends Microbiol 22:623-631, 2014. 7. Suzuki, Y. Sialobiology of influenza: molecular mechanism of host range variation of influenza viruses. Biol Pharm Bull 28:399-408, 2005. 8. Imai, M., S. Herfst, E. M. Sorrell, E. J. Schrauwen, M. Linster, M. De Graaf, R. A. Fouchier, and Y. Kawaoka. 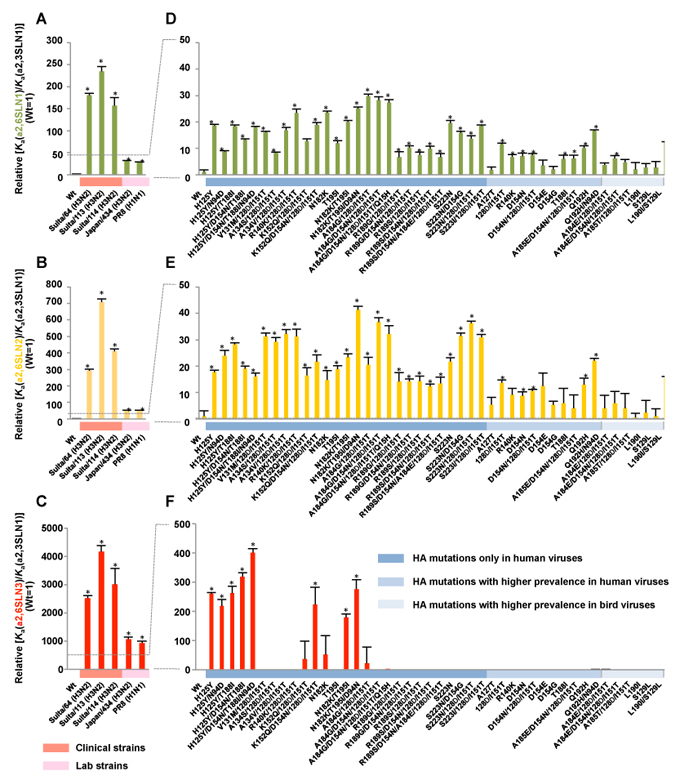 Transmission of influenza A/H5N1 viruses in mammals. Virus Res 178:15-20, 2013. 9. Matrosovich, M., A. Tuzikov, N. Bovin, A. Gambaryan, A. Klimov, M. R. Castrucci, I. Donatelli, and Y. Kawaoka. Early alterations of the receptor-binding properties of H1, H2, and H3 avian influenza virus hemagglutinins after their introduction into mammals. J Virol 74:8502-8512, 2000. 10. Nidom, C. A., R. Takano, S. Yamada, Y. Sakai-Tagawa, S. Daulay, D. Aswadi, T. Suzuki, Y. Suzuki, K. Shinya, K. Iwatsuki-Horimoto, Y. Muramoto, and Y. Kawaoka. Influenza A (H5N1) viruses from pigs, Indonesia. Emerg Infect Dis 16:1515-1523, 2010. 11. Watanabe, Y., M. S. Ibrahim, H. F. Ellakany, N. Kawashita, R. Mizuike, H. Hiramatsu, N. Sriwilaijaroen, T. Takagi, Y. Suzuki, and K. Ikuta. Acquisition of human-type receptor binding specificity by new H5N1 influenza virus sublineages during their emergence in birds in Egypt. PLoS Pathog 7:e1002068, 2011. 12. Yamada, S., Y. Suzuki, T. Suzuki, M. Q. Le, C. A. Nidom, Y. Sakai-Tagawa, Y. Muramoto, M. Ito, M. Kiso, T. Horimoto, K. Shinya, T. Sawada, M. Kiso, T. Usui, T. Murata, Y. Lin, A. Hay, L. F. Haire, D. J. Stevens, R. J. Russell, S. J. Gamblin, J. J. Skehel, and Y. Kawaoka. Haemagglutinin mutations responsible for the binding of H5N1 influenza A viruses to human-type receptors. Nature 444:378-382, 2006. 13. Chen, L. M., O. Blixt, J. Stevens, A. S. Lipatov, C. T. Davis, B. E. Collins, N. J. Cox, J. C. Paulson, and R. O. Donis. In vitro evolution of H5N1 avian influenza virus toward human-type receptor specificity. Virology 422:105-113, 2012. 14. Chutinimitkul, S., D. van Riel, V. J. Munster, J. M. van den Brand, G. F. Rimmelzwaan, T. Kuiken, A. D. Osterhaus, R. A. Fouchier, and E. de Wit. In vitro assessment of attachment pattern and replication efficiency of H5N1 influenza A viruses with altered receptor specificity. J Virol 84:6825-6833, 2010. 15. Imai, M., T. Watanabe, M. Hatta, S. C. Das, M. Ozawa, K. Shinya, G. Zhong, A. Hanson, H. Katsura, S. Watanabe, C. Li, E. Kawakami, S. Yamada, M. Kiso, Y. Suzuki, E. A. Maher, G. Neumann, and Y. Kawaoka. Experimental adaptation of an influenza H5 HA confers respiratory droplet transmission to a reassortant H5 HA/H1N1 virus in ferrets. Nature 486:420-428, 2012. 16. Linster, M., S. van Boheemen, M. de Graaf, E. J. Schrauwen, P. Lexmond, B. Manz, T. M. Bestebroer, J. Baumann, D. van Riel, G. F. Rimmelzwaan, A. D. Osterhaus, M. Matrosovich, R. A. Fouchier, and S. Herfst. Identification, characterization, and natural selection of mutations driving airborne transmission of A/H5N1 virus. Cell 157:329-339, 2014. 17. Ito, T., J. N. Couceiro, S. Kelm, L. G. Baum, S. Krauss, M. R. Castrucci, I. Donatelli, H. Kida, J. C. Paulson, R. G. Webster, and Y. Kawaoka. Molecular basis for the generation in pigs of influenza A viruses with pandemic potential. J Virol 72:7367-7373, 1998. 18. Kimble, B., G. R. Nieto, and D. R. Perez. Characterization of influenza virus sialic acid receptors in minor poultry species. Virol J 7:365, 2010. 19. Belser, J. A., O. Blixt, L. M. Chen, C. Pappas, T. R. Maines, N. Van Hoeven, R. Donis, J. Busch, R. McBride, J. C. Paulson, J. M. Katz, and T. M. Tumpey. Contemporary North American influenza H7 viruses possess human receptor specificity: Implications for virus transmissibility. Proc Natl Acad Sci USA 105:7558-7563, 2008. 20. Shinya, K., M. Ebina, S. Yamada, M. Ono, N. Kasai, and Y. Kawaoka. Avian flu: influenza virus receptors in the human airway. Nature 440:435-436, 2006. 21. Auewarakul, P., O. Suptawiwat, A. Kongchanagul, C. Sangma, Y. Suzuki, K. Ungchusak, S. Louisirirotchanakul, H. Lerdsamran, P. Pooruk, A. Thitithanyanont, C. Pittayawonganon, C. T. Guo, H. Hiramatsu, W. Jampangern, S. Chunsutthiwat, and P. Puthavathana. An avian influenza H5N1 virus that binds to a human-type receptor. J Virol 81:9950-9955, 2007. 22. Watanabe, Y., Y. Arai, T. Daidoji, N. Kawashita, M. S. Ibrahim, D. El-Gendy Eel, H. Hiramatsu, R. Kubota-Koketsu, T. Takagi, T. Murata, K. Takahashi, Y. Okuno, T. Nakaya, Y. Suzuki, and K. Ikuta. Characterization of H5N1 influenza virus variants with hemagglutinin mutations isolated from patients. MBio 6, 2015. 23. Chandrasekaran, A., A. Srinivasan, R. Raman, K. Viswanathan, S. Raguram, T. M. Tumpey, V. Sasisekharan, and R. Sasisekharan. Glycan topology determines human adaptation of avian H5N1 virus hemagglutinin. Nat Biotechnol 26:107-113, 2008. 24. Walther, T., R. Karamanska, R. W. Chan, M. C. Chan, N. Jia, G. Air, C. Hopton, M. P. Wong, A. Dell, J. S. Malik Peiris, S. M. Haslam, and J. M. Nicholls. Glycomic analysis of human respiratory tract tissues and correlation with influenza virus infection. PLoS Pathog 9:e1003223, 2013. 25. Heider, A., L. Mochalova, T. Harder, A. Tuzikov, N. Bovin, T. Wolff, M. Matrosovich, and B. Schweiger. Alterations in hemagglutinin receptor-binding specificity accompany the emergence of highly pathogenic avian influenza viruses. J Virol 89:5395-5405, 2015. 26. Hiono, T., M. Okamatsu, S. Nishihara, S. Takase-Yoden, Y. Sakoda, and H. Kida. A chicken influenza virus recognizes fucosylated alpha2,3 sialoglycan receptors on the epithelial cells lining upper respiratory tracts of chickens. Virology 456-457:131-138, 2014. 27. Scholtissek, C. Stability of infectious influenza A viruses at low pH and at elevated temperature. Vaccine 3:215-218, 1985. 28. DuBois, R. M., H. Zaraket, M. Reddivari, R. J. Heath, S. W. White, and C. J. Russell. Acid stability of the hemagglutinin protein regulates H5N1 influenza virus pathogenicity. PLoS Pathog 7:e1002398, 2011. 29. Murakami, S., T. Horimoto, M. Ito, R. Takano, H. Katsura, M. Shimojima, and Y. Kawaoka. Enhanced growth of influenza vaccine seed viruses in vero cells mediated by broadening the optimal pH range for virus membrane fusion. J Virol 86:1405-1410, 2012. 30. Daidoji, T., Y. Watanabe, M. S. Ibrahim, M. Yasugi, H. Maruyama, T. Masuda, F. Arai, T. Ohba, A. Honda, K. Ikuta, and T. Nakaya. Avian influenza virus infection of immortalized human respiratory epithelial cells depends upon a delicate balance between hemagglutinin acid stability and endosomal pH. J Biol Chem 290:10627-10642, 2015. 31. Stevens, J., O. Blixt, J. C. Paulson, and I. A. Wilson. Glycan microarray technologies: tools to survey host specificity of influenza viruses. Nat Rev Microbiol 4:857-864, 2006. 32. Gopinath, S. C., T. H. Tang, Y. Chen, M. Citartan, J. Tominaga, and T. Lakshmipriya. Sensing strategies for influenza surveillance. Biosens Bioelectron 61:357-369, 2014. 33. Watanabe, Y., T. Ito, M. S. Ibrahim, Y. Arai, K. Hotta, H. V. Phuong, N. L. Hang, L. Q. Mai, K. Soda, M. Yamaoka, E. D. Poetranto, L. Wulandari, H. Hiramatsu, T. Daidoji, R. Kubota-Koketsu, N. Sriwilaijaroen, T. Nakaya, Y. Okuno, T. Takahashi, T. Suzuki, T. Ito, H. Hotta, T. Yamashiro, T. Hayashi, K. Morita, K. Ikuta, and Y. Suzuki. A novel immunochromatographic system for easy-to-use detection of group 1 avian influenza viruses with acquired human-type receptor binding specificity. Biosens Bioelectron 65C:211-219, 2014. 34. Wagner, R., M. Matrosovich, and H. D. Klenk. Functional balance between haemagglutinin and neuraminidase in influenza virus infections. Rev Med Virol 12:159-166, 2002. 35. Xu, R., X. Zhu, R. McBride, C. M. Nycholat, W. Yu, J. C. Paulson, and I. A. Wilson. Functional balance of the hemagglutinin and neuraminidase activities accompanies the emergence of the 2009 H1N1 influenza pandemic. J Virol 86:9221-9232, 2012.